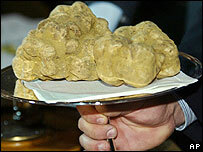 A truffle weighing 1.2kg (2.6lb) has sold for 95,000 euros ($112,000; £64,000) at an international charity auction in Italy. An anonymous buyer - reportedly from Hong Kong - purchased the white truffle via satellite link-up. A white truffle is a very rare type of mushroom that grows underground. A 850g (1.9lb) white truffle bought for £28,000 ($50,000; 42,000 euros) last year was then said to be the world's most expensive. That purchase ended in disaster, however. It was bought by a syndicate from Zafferano in Knightsbridge, West London, with the proceeds going to the Children in Crisis charity. When the head chef returned from holiday, he found that after too many days on display and in the restaurant's safe, the delicacy had been ruined.